Katana Tattoo has been offering quality work for over 20 years. Our artists are trained in proper and safe tattooing to ensure safety for all of our clients. We specialize in traditional Japanese tattoos, Japanese tattoos, traditional American tattoos, portraits, black and gray/grey tattoos, realism tattoos, bodysuits and Japanese bodysuits. 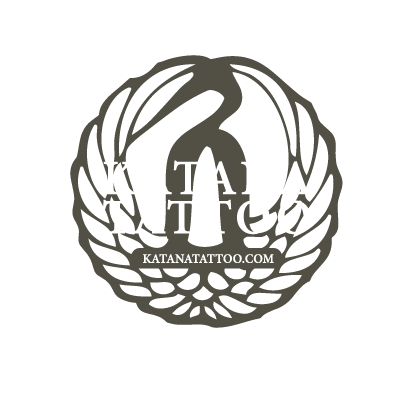 With the opening of Katana Tattoo, Paul is bringing over 21 years of world wide experience to the Midwest! His dedication, expertise and specialty in creating large Japanese and American style tattoos is unprecedented. I’m very excited to be apart of the Katana crew and show Wisconsin my realistic black and grey tattoos. Whether it’s a family portrait or a horror themed tattoo or some bioorganic work, I love doing black and grey work. Paul is an amazing artist & is really focused on his attention to detail which will leave you with something even more amazing than you have pictured. I got only my outline today & I am pumped to see it completed. I had a great experience working with John. He did my first tattoo and created a laid back, informative, yet professional environment. His work is nothing short of impressive and when it was all said and done, my expectations were surpassed. Will recommend to everyone and will be back shortly. Paul is by far one of the best tattoo artists I’ve ever had. Paul pays close attention to what your asking for, with a little guidance to get the best tattoo, and pays attention to detail in his art. His studio offers the comfort of real art, lots of talent and is very spacious. I would recommend Paul to anyone who is looking for a great investment of art on their body. I have received so many compliments on my sleeve so far and can’t wait for it to be finished. Jon, greatest artist we ever met. Did my son’s first tattoo came out more amazing then I could have imagine. My husband and I already have appointments for ourselves! VERY CLEAN,VERY FRIENDLY OWNER AND STAFF!!!!!!! Amazing tattoo shop. Extremely clean and spacious; Paul is a phenomenal artist, really pays attention to detail, and is a great listener when it comes to clients’ wishes. I love showing off his work, I get nothing but compliments! Thanks, Paul! Just got done with my first tattoo , Jon Gilbert did an outstanding job and was awesome to work with…Highly recommend him to anyone looking for a portrait or any other tattoo. His work as well as the rest of the staff at Katana is incredible !! Paul was a pleasure to meet as well and showed much interest in the work being done.